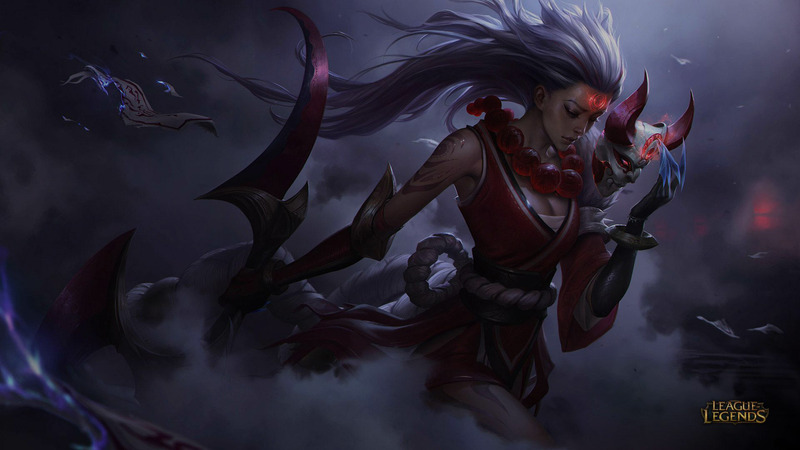 Blood Moon's Jhin, Diana, Twisted Fate and Talon skins? New Heartseekers - Lucian and Quinn. According to the Cultist – Blood Moon will shown up soon, that means that heavens are calling for a sacrifice. And champions, who are blessed up with the moon, are going sacrifice anyone who will be foolish enough to be caught beneath the Blood Moon. 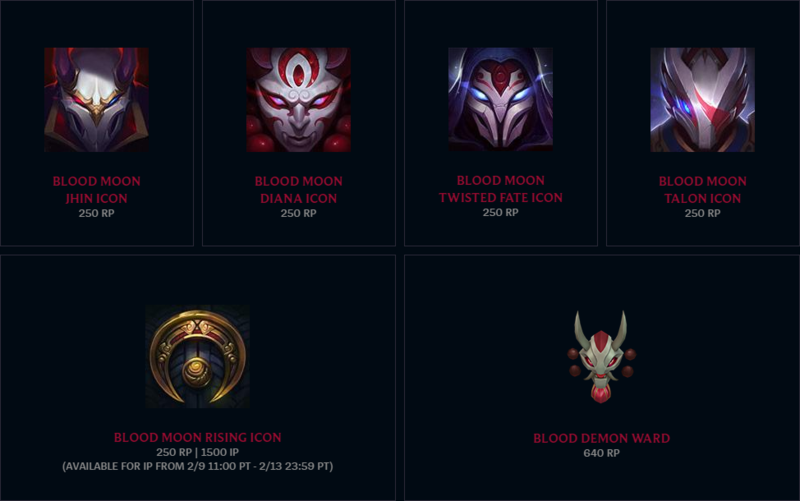 Also you can buy legacy skins from the past years for 5299 RP (just skins) 10158 RP (with champions), that includes skins for Akali, Zilean, Yasuo, Thresh, Shen, Kennen, Kalista, Elise. 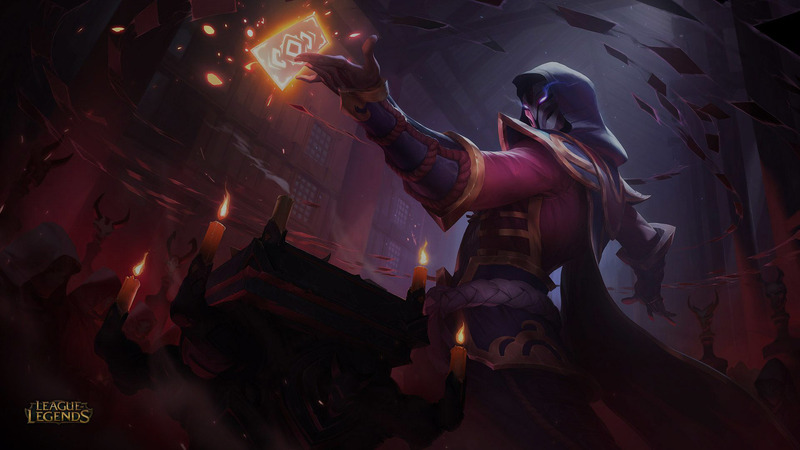 Jhin is a criminal psychopath who belives that murder is a art. But at this night he became even more dangerous. He will sacrifice anyone who he meet during that night with a great pleasure. He literally killing 2 birds with 1 stone, paying such high cost to the heavents, and master his ability to create a horrific arts that will put horror deep in heart of anyone who will see these abominations. 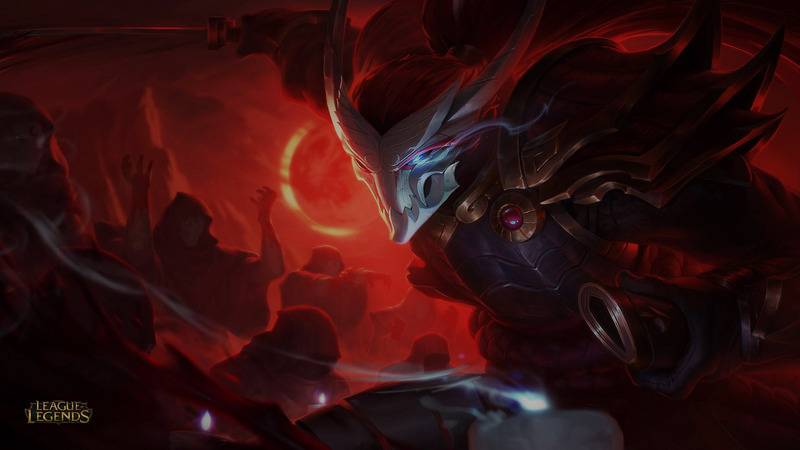 Even in peacetime, Jhin is an unpredictable enemy with which you must reckoned with, but do not forget that what he did before, was only on his whim. And now he has a duty to the Blood Moon, which makes him many times more dangerous. 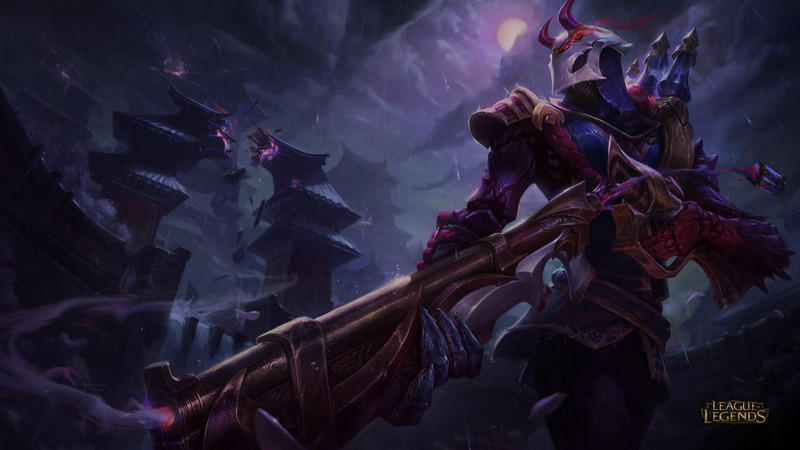 That night, he dressed in traditional cultist outfit colored to bloody red color with pale mask that hide his face, but every one who met him, know that it is Jhin, This rifle is too well known to all. Diana is the light that burns in the heart of the moon. She fights for the people of Lunari, who are known for their unbroken faith. Usually she wears silver armor colored as winter night, and many thinks that she is incarnate of the moon. But in this notorious night she cannot leave the heavens without their sacrifice. She, like the moon over her head, clothed in red robes and reap souls for the heaven. It is said that when she goes hunting the moon begins to shine brighter to indicate new victims to her’s “bloody priestess”. Twisted Fate is a real master of cards. He maintained the bad glory among the wealthy world. This rascal doesn’t take anything seriously and behaving too provocatively. Contented smirk rarely peel off from his face, but at this night he became serious. His behaviour is changing dramatically, and only a few can identify Twisted Fate in this grim and gloomy cultist. He sows death using deck of disasters and people cannot agree, whether he is a demon from the Kingdom of spirits, or the ordinary mortal who claim their lives for the name of the moon. The truth will always be known only to him alone, and the souls he has locked in his cards. 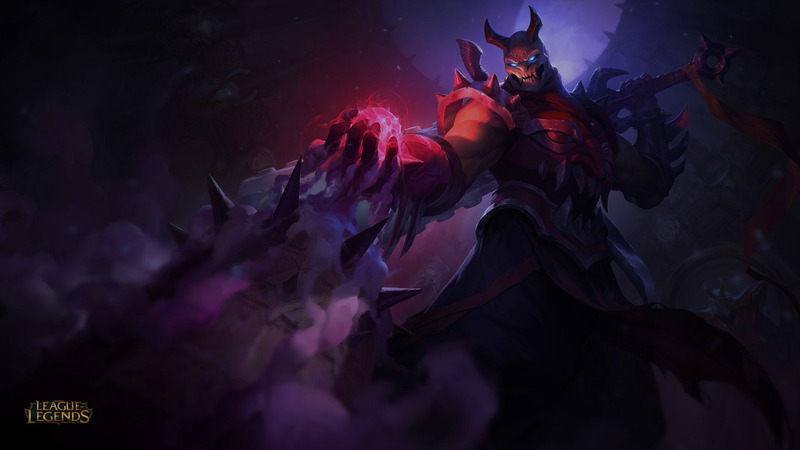 Talon – unbeaten master of the blade, he grew up in dark and dangerous dungeons of Noxus. Only his skill in handling the blade, savvy and sharp wit have helped him to survive his childhood. Now he is one of the strongest masters of the blade across the Runeterra and serves to the High Command of the Noxus, but he only obeys to the Du Coto, because he respect only power, and no one can beat the head of Du Coto house in a fair fight. 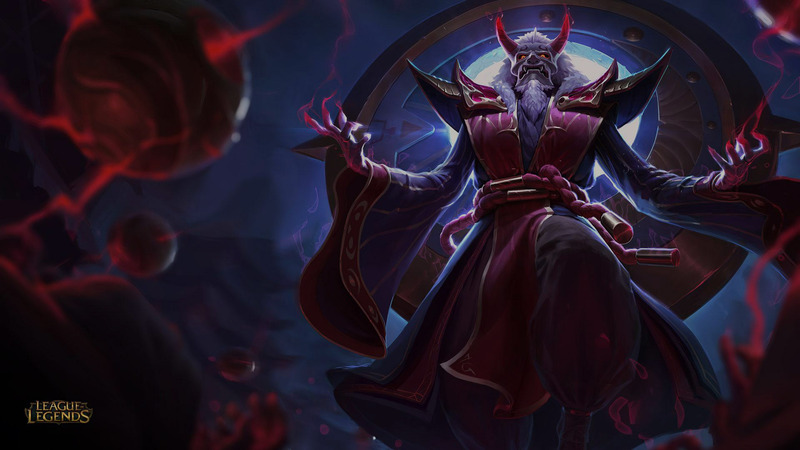 It is unknown why Talon joined to the Blood Moon, but it is known that now that night has become much more dangerous and those who leaves their houses will not return. Rumours spread about him, and according to them he was born at this night and moon gifted all skills to him, and now, to pay for such a generous gift, he once in a year brings a horrific gifts to the Blood Moon. He overtakes the victims, jumping above on them appearing on the background of the Bloody Moon only for a moment before their demise. But enough about the bad, because now this wonderful day! 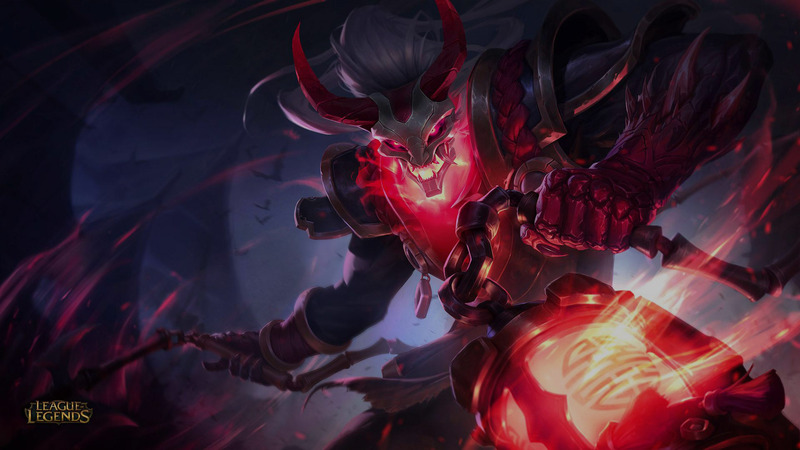 Valentine’s day, a day when even the most gloomy champions are transformed. 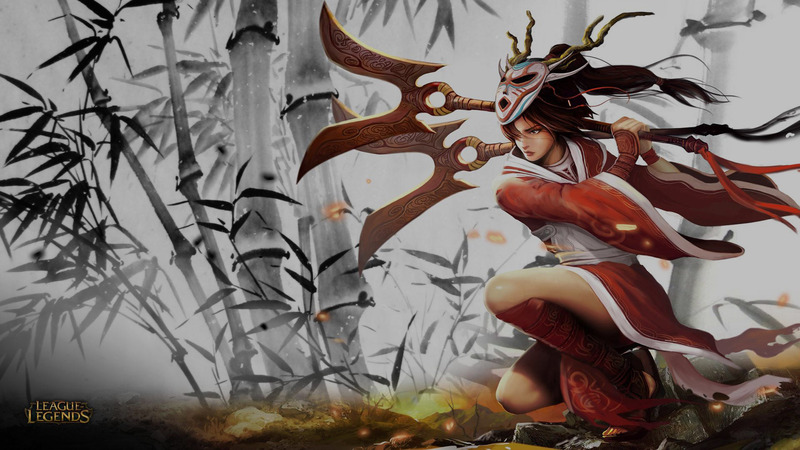 It’s this day when heroes like Lucian, Quinn, Ashe, Vayne, Varus, Orianna, Sona and Annie go hunting. And they are hunting for your hearts, because they just can’t ignore the Happy Valentine’s Day! 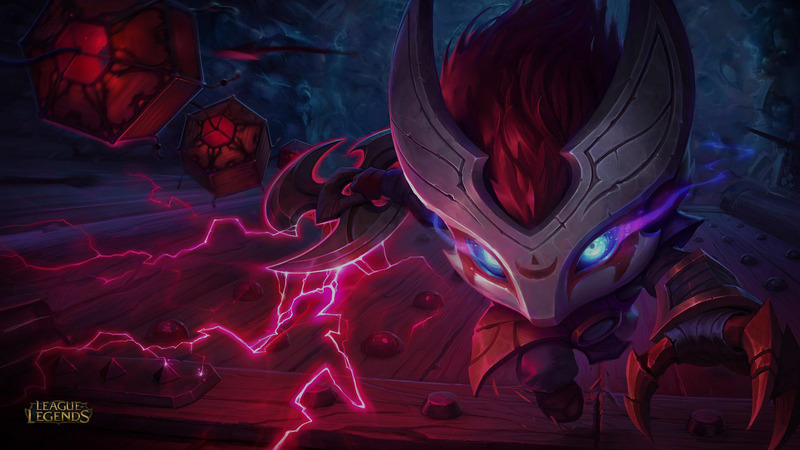 Welcome the new champion – Lucian that finally can feel the love in the air. You can barely recognize him now. Where his ancient pistols, with which he fights back against a horde of the living dead, where his protective robes, that saves him from the dark enchantments? None of this left, because today is the day when love is all that really matters, and even such heroes need to rest sometimes. Now he will be able to fight through to any heart with his new pistols. He wore his best suit. and ready to conquer hearts of everyone who stand in front of him. Just take a look at the updated animation, they all breath with love. Even his Recoll look like an invitation. Quinn and Valor are the best among the best. Her accuracy was always impressing, as loyalty of her hand dove. But on this day, you are out of luck, because you become the subject of her hunting. And not even the hope that she might miss or lose you from her sight. The only thing that can comfort you today that she hunts not for your head, she tries to conquer your heart! After spending some time with updated Quinn you can feel how love elevates you into the air, but be careful and check whether it is love or not, because of her faithful Dove always somewhere nearby. Meet the Gangplank, son of the dread pirate captain Vincent the Shadow. 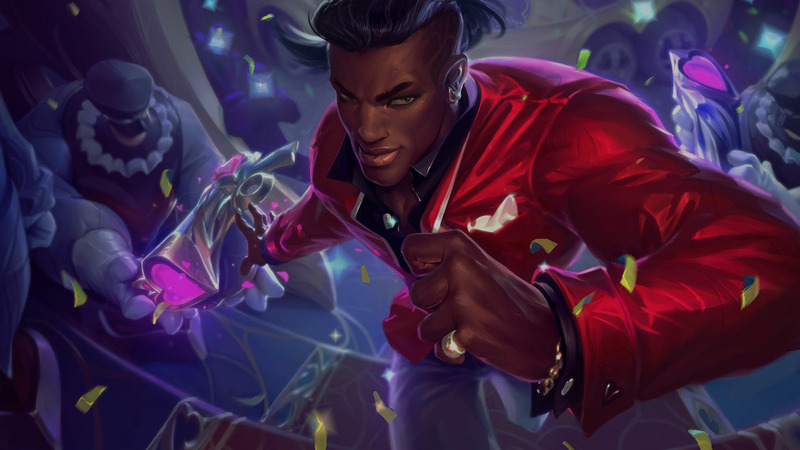 He became a Pirate as his father, but Riots think that casual pirate is not fun enough, and they released a new, awesome skin for him. Now he can terrorize not only the Runeterra but all the Galaxy. And even more, according to the rumors he can destroy entire planets. As our informer said that just before explosion a giant skull was forming on surface of the planet. And Gangplank is the only space pirate that we know. So if you ever see his dreadfull, massive spacecraft up in the sky, then you know, that your plannet is doomed. 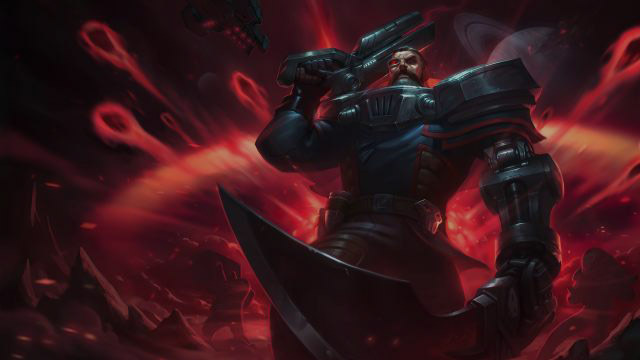 You can buy Dreadnova Gangplank for 1350 RP. And I just couldn’t highlight this applicant in my review of the new skins, though it came out in the past, 2016 year, but she dig it so deep in my heart that I just couldn’t leave her unattended. Meet – Elementalist Lux. This new skin includes 10 new forms: Light, Water, Fire, Air, Nature, Ice, Storm, Magma, Mystic and Dark. You will always start games in the Light version, and later with a set of experience you will have the possibility to choose between the elements of the nature – Fire, Nature, Water, Air. Later, as enhancing your champion you will have another choice, and combining these elements you will get hers final form. Try to mix all elements and you can get many different forms, for example, to get the Magma form, you must select the Earth and Fire. 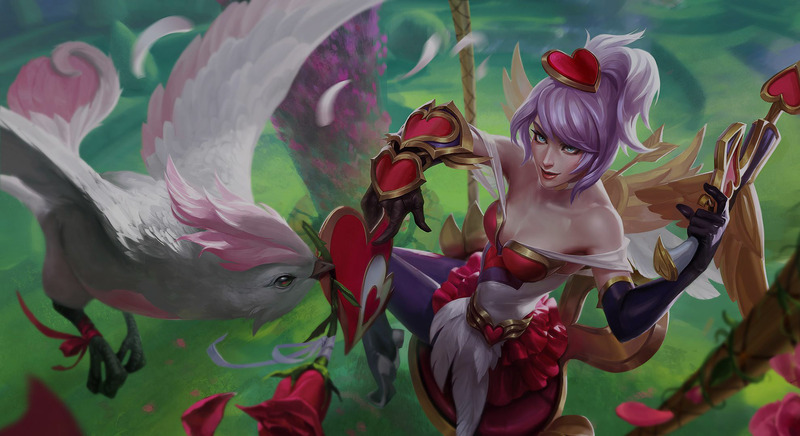 Of course cost of this skin is really high – 3250 RP for the skin, and 3950 RP for the master edition, that includes Elementalist Lux skin, Lux as champion (if you don’t have her in your collection), five icons and the Elementalist Ward skin. Icons represent her final forms – Darkness, Magma, Ice, Storm and Mystic. Ahhh, again missed this Blood moon event! There were any reward for it this time? 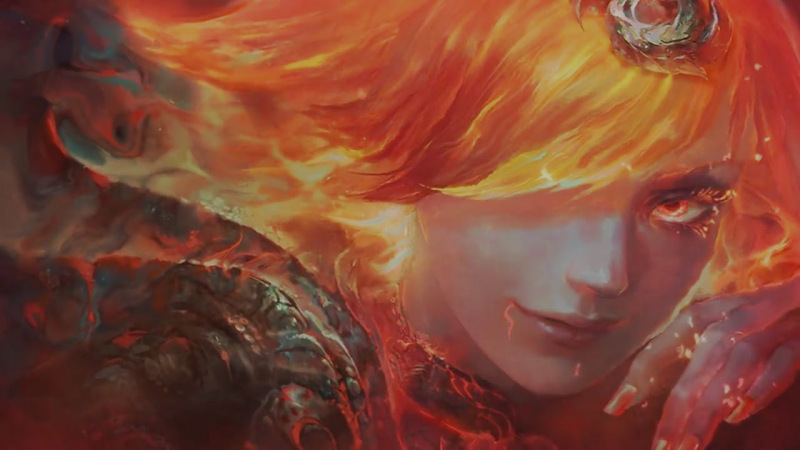 I hope that in some bright day they will set sale on this Elemental Lux skin! IT IS GORGEOUS!!!!!!! Duuude, I hope you doesn’t missed it :D Recently Riots set a sale for the Elementalist Lux and everyone who wants this ultimate skin now have it. And now about the review – nicely done work fella! 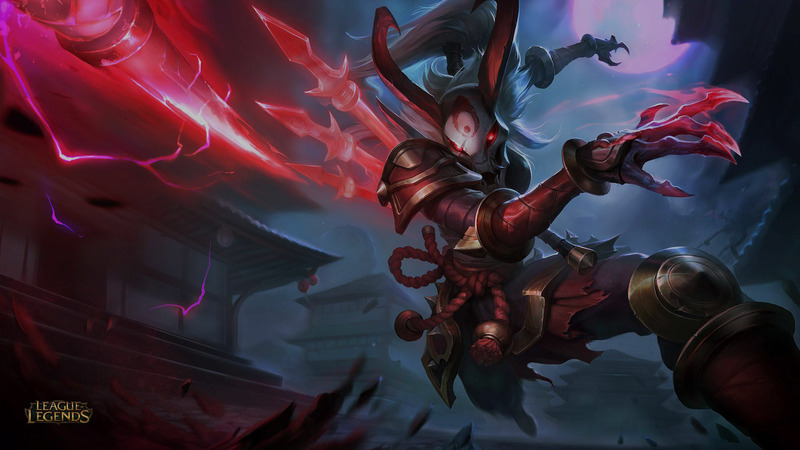 The 2017 year seems to be a beautiful year for LoL, and I hope that even greater skins will be released until the end of the year.